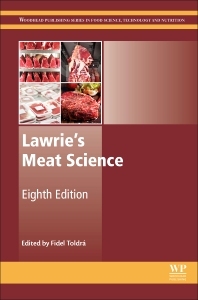 Lawrie’s Meat Science, Eighth Edition, provides a timely and thorough update to this key reference work, documenting significant advances in the meat industry, including storage and preservation of meat, the eating quality of meat, and meat safety. The book examines the growth and development of meat animals, from the conversion of muscle to meat and eventual point of consumption. This updated volume has been expanded to include chapters examining such areas as packaging and storage, meat tenderness, and meat safety. Furthermore, central issues such as the effects of meat on health and the nutritional value of meat are analyzed. Broadly split into four sections, the book opens with the fundamentals behind the growth of meat animals. The second section covers the storage and spoilage of meat products, with the third section exploring the eating quality of meat, from flavor to color. The final section reviews meat safety, authenticity, and the effect of meat on health.